GET READY – something awesome has just arrived at our facility! We’re proud to announce that we are now carrying The Best Bar Ever! If you currently eat a protein or snack bar, be prepared to change the way you think about them forever. It’s Nutritionally Balanced – The truth is, most protein bars are simply candy bars in disguise. Though marketed as “Healthy”, they are full of fillers, sugar alcohols, and other unnatural ingredients. Not The Best Bar Ever! Packed with 15g of protein, this Gluten-Free bar is made from a nutritious blend of mixed nuts, dried fruit, oats, premium proteins, honey, and molasses – all in balanced combinations. This provides you with a perfect blend of healthy fats, quality carbs, and premium proteins. Made Fresh Weekly – Most protein bar companies load their bars with unhealthy preservatives and chemicals just to give them a long shelf life. Not The Best Bar Ever! This bar is made FRESH from scratch on a weekly basis. Using only real food and premium proteins, its only preservative is the refrigerator! After all, if something can sit on a shelf for years and still be edible, doesn’t that tell you all you need to know about its ingredients? This Bar Tastes AMAZING – If you’ve had a protein bar before, we’re sure you’ll agree that most are extremely dry and taste like a mouthful of chalk. Not the Best Bar Ever! This bar is soft and moist, with a delicious nutty, yet sweet taste. Its incredible taste is actually how the bar got its name. “This is the Best Bar Ever” is the most common thing people say after trying it for the first time. After just one bite, we’re sure you’ll agree! 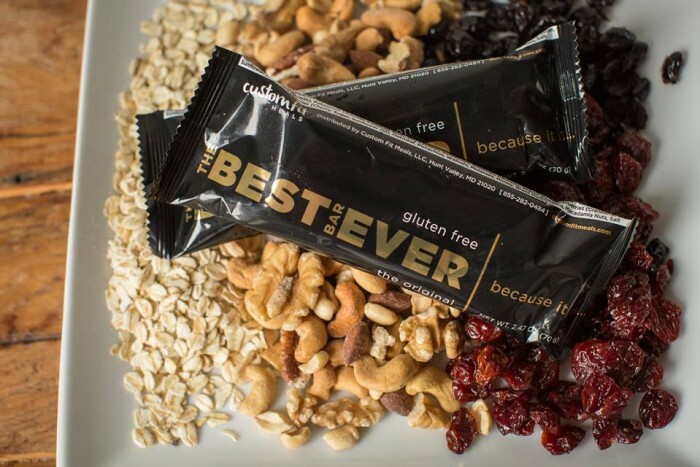 The Best Bar Ever gives you just that – the convenience of a protein bar, but the nutritional value of a healthy meal or snack. Created by chefs, The Best Bar Ever is made fresh to order using REAL food and premium proteins. Serving as a functional food (not just a protein bar), the quality of our product is apparent not only in its taste, but also its nutritional value. Packed with 15 grams of protein, this Gluten-Free bar consists of a balanced combination of mixed nuts, dried fruit, oats, blended proteins, honey, and molasses. This provides you with an optimal blend of healthy fats, quality carbs, and premium proteins. Unlike most bars that are extremely dry, The Best Bar Ever is soft and moist, with a delicious nutty, yet sweet taste. In fact, it’s incredible taste is how the bar received its name. “This is the Best Bar Ever” is the most common thing people say after trying the bar for the first time. After just one bite, we’re sure you’ll agree! Protein is an essential part of any diet. Numerous studies show that eating adequate amounts of protein can improve body composition, eliminate hunger, and reduce body fat. We pack our bars with 15g of premium proteins coming from a whey isolate and casein blend. Since whey is a fast-release protein and casein is slow-released, this provides a rapid, yet sustained, delivery of protein building blocks to your muscles. Healthy fats are essential for proper health. The key is to make sure you are eating enough of the right types of fats (e.g. mono and poly-unsaturated). To help you with this, we’ve added 17g of heart-healthy fats to our bar. These fats come solely from mixed nuts (equivalent to one small handful), which are rich in vitamins, minerals, unsaturated fatty acids, antioxidants, and are an additional source of protein. According to a 2009 study in the American Journal of Clinical Nutrition, consistent consumption of a healthy portion of nuts has been proven to promote weight loss and curb obesity over time. Our gluten-free oats represent a quality, complex carbohydrate and good source of fiber. In fact, oats contain the highest proportion of soluble fiber compared to any other grain. Soluble fiber slows down digestion and delays the emptying of your stomach. This helps to curb hunger by keeping you feeling satisfied for longer periods of time. Potential health benefits of oats also include: reducing the risk of coronary artery disease, lowering levels of cholesterol, and reducing one’s risk of colorectal cancer. For an antioxidant boost, we fill our bar with cherries and cranberries. Cherries are loaded with a specific type of antioxidant known as anthocyanins. Anthocyanins are known to prevent tumor formation, keep vision sharp, and boost heart health. Cranberries, often referred to as a “super food”, are also a great source of vitamin C, fiber, and vitamin E.
Most protein bars are marketed as “sugar free” or low in “net carbs”. While this may look good on a label, proceed with caution. In order to achieve these often misleading claims, companies will replace natural sugars with sugar alcohols, which are known to cause bloating and gastrointestinal discomfort. Instead of sugar alcohols, we use a touch of honey and molasses to naturally sweeten our bar. Note: Total sugar content in The Best Bar Ever is equivalent to ½ an apple. Now that you’re more informed, we invite you to get back to the basics of real food. Try The Best Bar Ever today and Taste the Difference.